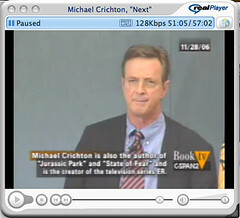 According to his site, author Michael Crichton died after an unsuccessful battle with cancer. Most famous for the novels Jurassic Park and the Lost World, I first read his book in school, namely Congo. Another of his book, The Andromeda Strain is a book on my reading list. A very popular Sci-Fi author, he will be quite missed. The literary world has suffered a major loss today.